Shopping for new health and beauty products such as shampoo, body wash, and face wash can be overwhelming if you are trying to find as new brand or product to try. In stores, there are aisles upon aisles of choices and online there are even more! When trying to read reviews online, there are always contradicting reviews and even when you find a product with mostly good reviews, it is hard to know if they are real reviews or paid reviews from the company. Because of this, I figured I would round up a bunch of these items I currently use or have tried recently and help give some recommendations. 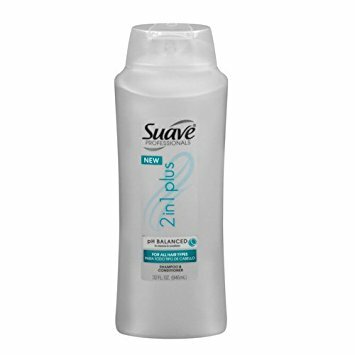 Suave Professionals 2 in 1 Plus - I have been using this shampoo for many years and it is still one of my favorites. It is widely available, reasonably priced, has a good scent that is clean but not over powering. It works well as a shampoo and even a body wash. I consider this my go-to wash of choice. 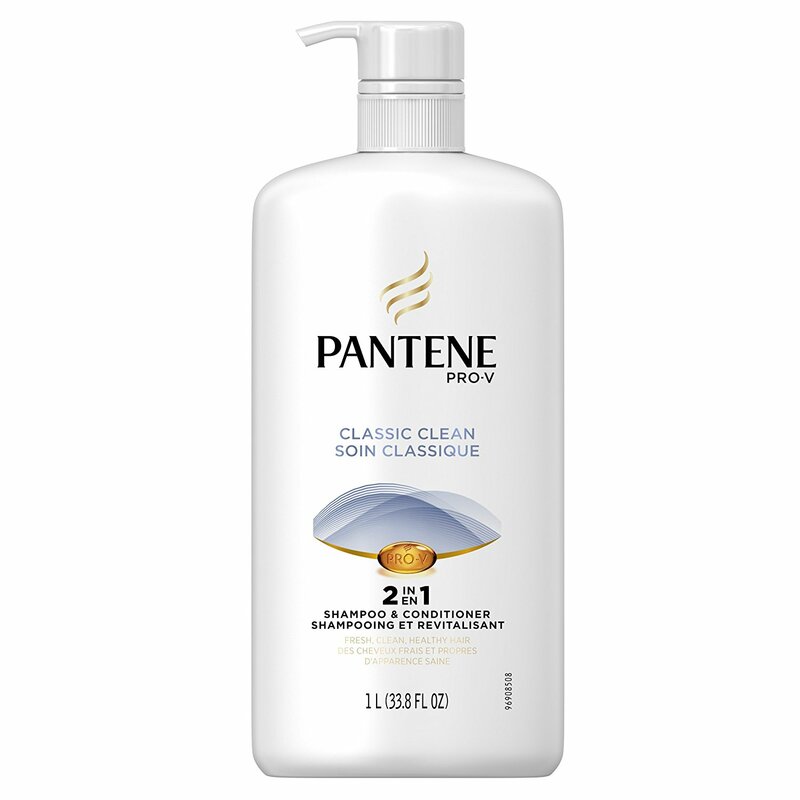 Pantene Pro-V Classic Clean 2 in 1 - This is one of my new favorites in the shampoo and conditioner category. 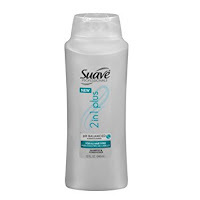 It is more expensive compared to Suave, but the scent is great and it has a silky texture with just the right amount of lather. It is also available with the pump style top which is very convenient. 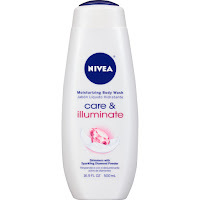 It works well as a shampoo as well as a body wash.
Nivea Care and Illuminate - I tried this one because it was 50% off probably because they were in the process of changing the name from Touch of Sparkle. 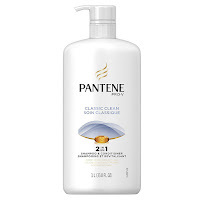 Overall it has a nice scent and that can be a little stronger compared to other similar products. It is very smooth and moisturizes the skin well. I would get it again if it was on sale but at full price it is a little expensive for this quantity. 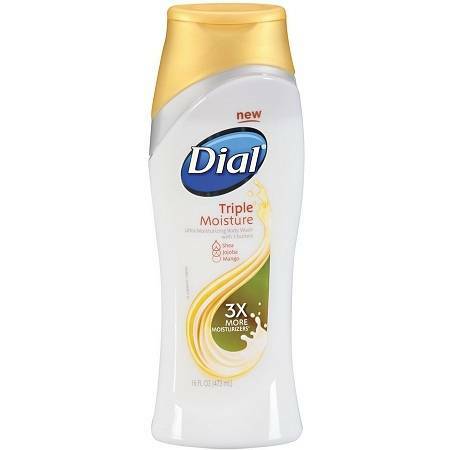 Dial Triple Moisture - This is one of the newest body washes I have tried. I also found this one on sale which was an incentive to try it out. The scent is mild but pleasant. The consistency is smooth with a little elasticity and it has a good amount of lather. I noticed the bottle design is a little misleading in that it makes it appear to contain more than it actually has. Overall it was ok but I would not rush back to buy it again. 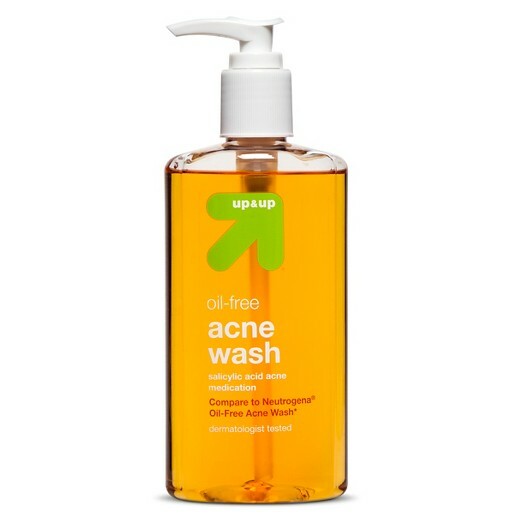 Up & Up Oil Free Acne Wash (Target Brand) - This is Targets version of the Neutrogena face wash. I find it works about the same as the name brand and is a little more affordable. 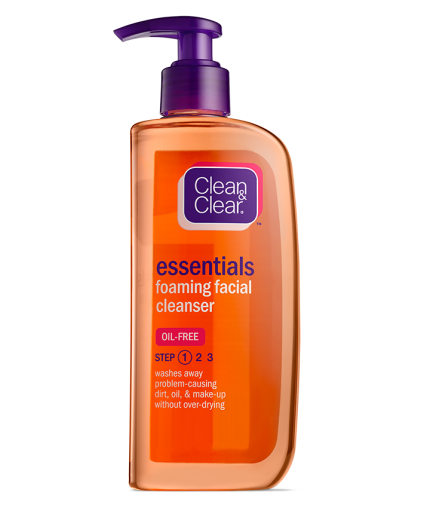 It does a nice job at cleaning the skin especially if you have oily skin. It can be a little over drying so you may need to use it in combination with a moisturizer afterward. 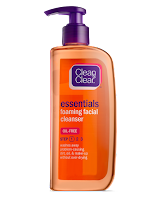 Clean & Clear Essentials Foaming Facial Cleanser - I tried this as an alternative to the Up & Up brand to see how it would compare. The scent is kind of strong and it is incredibly drying. At first it feels smooth on the skin but once you start washing it off, you get that really grippy dry feeling. I find it is ok to use once in a while, but I would prefer the Up & Up style given the choice. 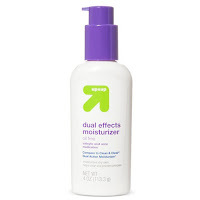 Up & Up Dual Effects Moisturizer - To combat the over dryness of the face washes, I first tried this moisturizer. It is ok but the thing is it contains salicylic acid which is supposed to help with acne, but it also dries the skin and makes it peel. So it kind of counteracts itself. 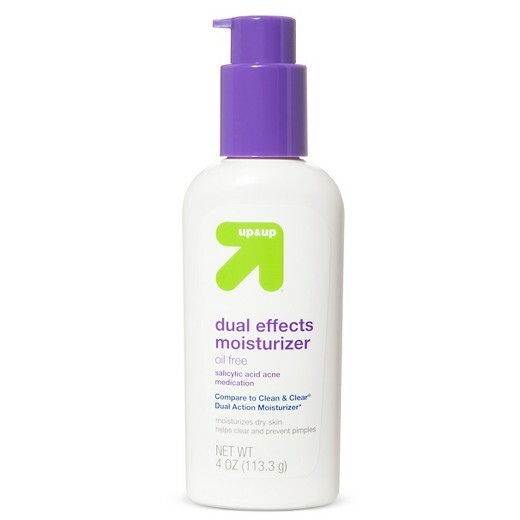 I found it moisturizes at first but then it seems to make the skin peel more later so I stopped using this one for now. CeraVe Moisturizing Lotion - I decided to try out this moisturizer by CeraVe which does not have the salicylic acid. So far it has been doing a pretty good job at re-moisturizing the skin after a wash. It is available in a small 3oz bottle and it is not too expensive. 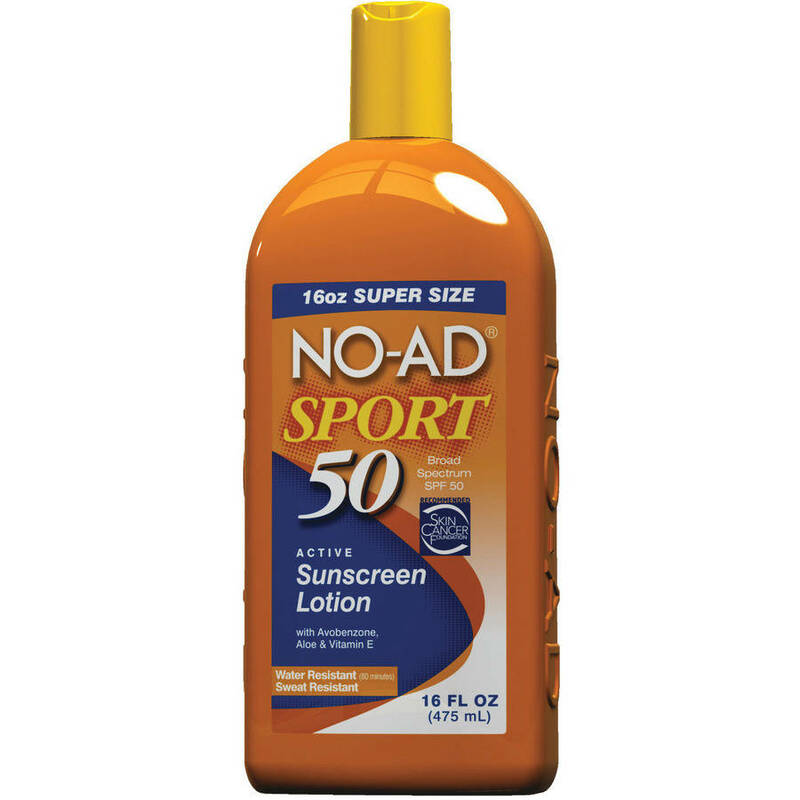 So far, it is still early to tell on the long term results but so far it has been working ok.
No-Ad Sport 50 - Rounding out the list is a sunscreen lotion by No-Ad. I have been using it since last summer whenever I am going to be out in the sun a lot and so far it has had good results. 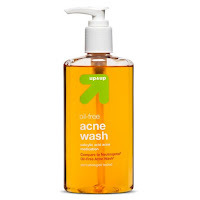 It goes on the skin nicely and does not feel too oily. I have not had any issues with burning while using this lotion. Overall it was a good value for the price especially if you can find it on sale during the off seasons! Hope this helps when doing research on which health and beauty products to try out. If you have tried any of these or have another to recommend, feel free to share it in the comments. Swiss Army knives have been around for many years and are one of the most popular multi-tools around. I was first introduced to them by my grandfather who had one with many functions. I was very impressed how many different items could be packed into such a small package. He gave me one of his older Swiss Army knives which I still have to this day. A few years later I decided to buy my own Swiss Army knife. I got the Super Tinker which has tools such as knife, scissors, flathead and phillips screwdriver, as well as things like bottle opener, tweezers, and toothpick. It was a great purchase and I got a of use out of it. Some time later, I was taking a trip where I had to fly to another location. I did not have too much experience with flying so I thought it would be ok to bring with. Unfortunately it got stopped at the check-in and they would not allow my to bring it with. We were in a hurry so I was not able to check it or set up a way to send it back home so I ended up having to leave it there. It was pretty disappointing but I soon replaced it with the same model. I have had the Super Tinker for many years now and it is still in great condition. One thing about authentic Swiss Army knives is they are super high quality. I didn't even realize how good the quality was until I was given a multi-tool from a different company as a gift. The quality on the other tool was no where near the quality of the Victorinox. It made me appreciate it even more and want to write up this article here about them. I would consider it one of my best purchases in terms of quality, value, and usefulness. If you have never had one of these before, I recommend checking them out. They are available in many different styles and sizes ranging from simple pocket knives to multi-tools with dozens of functions. They are available online at Swiss Army, Amazon, as well as local retailers such as Walmart and Target. A while back, I found a lost iPhone on the ground, so I picked it up to try to figure out who it belonged to. Unfortunately it had the lock screen with a passcode so I was not able to reach the contacts or pull up the information for the owner. Luckily I found it in a large residential building that has an office so I was able to return it to the office for them to hold on to until the owner was able to retrieve it. This got me thinking, it should be easier to find the owner of a lost phone since it is something that is important and can be lost very easily. I wanted to figure out a solution I could use for my phone in case it were to get lost. This way, whoever finds it would be able to contact me or return it quickly. First I thought of the possibility of just putting the contact information right on the back of the case, for example, typing it up on paper and taping it onto the case. While this would work, it kind of ruins the aesthetics of the phone and I decided I didn't really want the contact information to be out in the open like that all the time. I started looking for ways to get the contact information on the lock screen of the phone so if someone finds it, they can pull up this information just by pushing the home button. 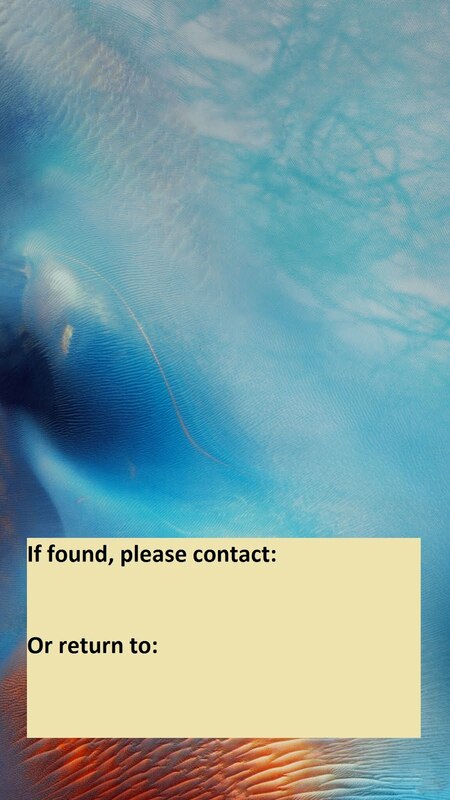 One method I found is by activating the “Find My iPhone” app and putting the phone into Lost Mode. This can be done by logging into iCloud either on a computer or from another iPhone. You will be able to log in using your Apple ID. When putting it into Lost Mode, you will be able to enter text that will display on the lock screen, so you can put your contact information there. While the above method works well, if your phone is lost and you are out and about, you may not have immediate access to a computer or another phone. Or you might have forgotten your Apple ID or password. In this case, it might be hours before you are able to get home or figure out your login for the app. Because of this, I wanted to figure out a way to get the contact information on the lock screen without having to activate the Find My iPhone app. First, I did a search on the computer and found the iPhone wallpaper I wanted to use. (I just used one of the stock images.) Next I downloaded the image and opened it up in a basic image editing program such as Microsoft Paint. From there, I was able to add text and put in my contact information for email and return address. You can put a message such as, “If found, please contact or return to...” Finally save the updated image. Once the image is saved, you can email it to your phone as an attachment. After the image has been sent, open the email on your phone. It will show the image. If you touch and hold on the image, it will bring up the options. Click “Save Image” and it should save it to your phone in the Photos section. Next, go to your Photos on the iPhone and click on the image you have just saved. To bring up the options, click the box with the arrow pointing up (located at the bottom left corner). Swipe over a few options and it will it will say “Use as Wallpaper”. Then click Set. It will have the option to set as lock screen, home screen, or both. I set it as lock screen because you don't really need it in the background once your phone is unlocked. That's it! Your new lock screen background will be in place with the contact information. It sounds like a lot of steps and I'm sure there are other ways to go about it, but it is worth it for peace of mind knowing that if your phone gets lost, it will be much easier for people to get it back to you. Hope this helps! Unknown Certified Mail – What Could It Be? 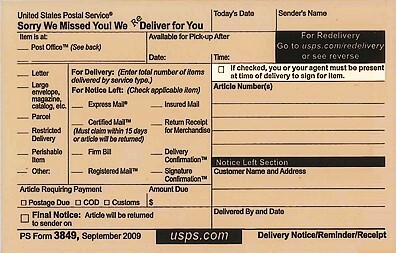 I recently checked the mail and there was a note card from USPS saying I had missed a delivery for a certified mail and that I had to reschedule the delivery. It was a letter and had a tracking number and a name, but I could not read the writing so I could not tell who it was from. I started thinking what it could be but I had no idea who would be sending me a certified letter. Usually if something is sent certified, it means it is very important and the sender needs to be positive you have received it. The only other time I ever got a certified letter was after I left a job and they were sending me some final paperwork to confirm the decision. I got the note on a Friday and the earliest reschedule was on Monday so I had a couple of days to worry about what it could be. Of course I thought the worst like it was a legal issue or something, but nothing came to mind on what it could be. Another thought was maybe it was some important documents from the health insurance or from a retirement fund or something, but I have never had to sign for any of those before. About a week back, I contacted a couple companies about mail I was receiving that was addressed to previous residents who have not lived here for many years. I asked them to update the mailing list so I would not receive the letters anymore, so I was thinking maybe it had something to do with that and they were trying to confirm I was the current resident. I kept thinking of possibilities. Sometimes I fill out those surveys on receipts that offer a chance to win a gift card so I was thinking there might be a small possibility maybe I won something like that and they sent it certified to make sure I got it. So finally Monday rolls around and the mail man shows up. He has the letter and I sign for it. I look at the return address, but it is something I didn't recognize and never heard of. I take it in and open the letter. Turns out it is a notice about a public hearing about a potential business that is looking to open up in the area. At first I was relieved that it was not anything bad. Then I was kind of confused as to why they sent something like this certified. It was basically a note from the village and the business owners saying there would be a meeting at the village and that is was open to residents in case we wanted to go to the meeting. Maybe there is some rule that they have to notify a certain amount of local residents if they are looking to open a new business. Other than that, I'm not sure why they needed it to be signed for. 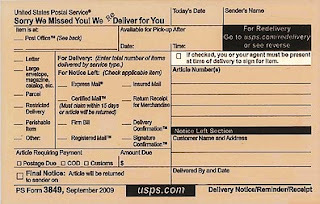 The postage was almost $4.00 for a letter so it was certainly not cheap to send it. I guess the lesson learned here is if you get an unexpected certified letter, don't worry because it might be something like this that is nothing to worry about. Over the years, I have listened to a lot of music and if I had to make a list of my favorite bands, Lucky Boys Confusion would have to be on that list. In case you have not heard of them before, they are a rock band out of the Chicago area that formed back in 1997. Their music style can be described as a mix of rock, pop, punk, reggae, and world music. They released several great albums over the years but had been on a hiatus since their last release in 2009. I first discovered Lucky Boys Confusion many years ago when their single “Fred Astaire” was on the radio, but it was not until years later when I saw them in concert and got a chance to listen to some of their albums that I really became a big fan. They have so many good songs and a wide range of musical style. I went to many of their concerts and still remember the time my friends and I had to figure out how to get into one of their concerts because it was all sold out. A few months back, there was some exciting news that LBC was starting to record new songs and was actually in the process of putting together a new album. I was a little worried because often when bands take a lot of time off and then try to come back and recreate what they had before, it does not work out very well. Thankfully, with Lucky Boys, it is like they have not missed a beat. The new music is sounding as good as ever! Leading up to the new album, I was able to hear a few of the new songs including “It's After Midnight”, “Sun In My Eyes”, and “Stormchaser”. All 3 are quality songs that are very catchy and were stuck in my head all day after just one or two listens. After much anticipation, the wait is finally over and the new album Stormchasers is available now! You can check it out on Spotify, iTunes, Amazon, Bandcamp, as well as order physical copies and merchandise from their official site. I just listened to the full album today and it sounds great! The songs are powerful, heartfelt, and a good representation of a matured band that has been through a lot and is still going strong. If you are a fan of Lucky Boys Confusion or if you are new to the band and looking to discover some new music, I highly recommend checking out the new album! After trying out Netflix for a couple months, I decided to try out Hulu, another one of the big online streaming services. Like Netflix they offered a free month trial so I decided to give it a go to see how it compares. Setting up an account was pretty easy but it was about to only give a 2 week trial for some reason. I managed to reload it and got the 30 day free trial as advertised. I started with the basic $7.99 plan which has commercials. I quickly found out that waiting for commercials for online content like this is very annoying and pretty much unbearable. Luckily they allow you to upgrade to the $11.99 no commercial plan during the 30 day free trial. So I switched to the no commercial plan which was much better. One thing that is nice about Hulu is they have new episodes for many of the current on air shows. So for example if you miss an episode on tv, you can often watch it commercial free on Hulu. This is one of the differences I found when compared with Netflix which tends to add full seasons at one time either after the series has aired or if it is an original show. Navigation of the shows and movies is pretty easy. The top menu seems to be a bit limited until you get into the categories. I think it could use a little reworking to show more options in the menu. Like Netflix, they offer the convenient option of adding shows to your Watch List to save for later. I found the selection of tv shows and movies to be pretty good. They have a rotating selection like Netflix as new content is added and older content is removed. I found Hulu to be a little bit like Youtube in the fact that they have a lot of clips and trailers in addition to full episodes. Use with a streaming player such as Roku on a tv is very easy. After logging in the first time, it is saved so loading it back up is very fast. Hulu keeps track of viewing history like Netflix as well so you can see what you have watched in case you want to go back and review. Also Hulu has the option to set up profiles in case you have several people in the household using the same account. There is a 5 star rating system like Netflix but the reviews section seems to be more limited. I noticed they have the option to comment on the shows and movies but there did not seem to be much activity going on in the comments. Overall I have been pleased with Hulu and it is a good compliment or alternative to Netflix if you don't mind the extra price for the no commercial plan. In terms of value, Netflix still has the edge with their basic no commercial plan starting at $7.99. If Hulu could match this price for the no commercial plan, it would be a very even match. I always look for the best deal so if I had to pick just one service, I would probably go with Netflix.